We have many smart reason for you to invest in Ashoka Aarna. It has a real 120 acres lake view along with forest view. Go through all the smart reasons for you to buy an Ashoka Aarna premium plot today. BMRDA approved layout with approval no: BMRDA 25/2012-2013. Flat layout with NO high tension wires inside the layout. Hassle free and clear property titles. High quality standards in materials used. We have used KEI cables, supreme drain systems and the best possible brands in the layout. Layout association for maintenance and harmony of the plot owners. Very Near to 8 Lane - Peripheral Ring Road (PRR) to be developed by BDA . Proposed 80 Feet Road connecting the layout to Art of Living junction. To reduce you 2 kms distance. 10 Mins Drive to Proposed Metro Phase 2 rail project in kanakapura road. 10 Mins drive to Bannergatta Road and 15 drive to Electronic City through NICE road. Near to Brigade Meadows and Concorde Napa Valley. Adjoining Bannergatta forest, which ensure pollution free living. 120 Acres lake just 100 metres away from layout. Top Schools: Valley International, DPS, Kumarans, Ryan International School, EDIFY and many more.. Hospitals: 20 minutes drive to apollo and fortis hospital on Bannergatta Road. Colleges: Dayanandsagar college, KSIT, YDIT, APS are few top Engineering colleges in Kanakapura road. AOL Ashram, Tech Park spread over 85 acres consists of college and hospital, School and meditation center. METRO Retail is located in Kanakapura road. (25 Minutes Drive). 400 Acres, world class textile and apparel park near Kanakapura (Harohalli) by Gokaldas-SEZ. 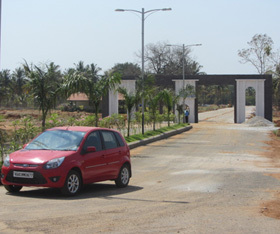 Famous Tataguni Estate spread across 450 acre estate is also in Kanakapura road. Iskcon Temple and proposed disney land project to developed in Kanakapura road. 13000 Square Feet Commercial Complex. inside the layout with lake canal. Real lake flowing through the layout. 7 parks with total 7 acres area along with children play area. A minimum of 100% appreciation within 2 years can be expected for a BMRDA property in this location. A well planned layout with adequate land area for build well planned parks. The entire layout is 100% free from high tension electrical cable lines/pillars. My search for a tranquil, clear titled property with easy accessibility ended me in buying at Ashoka Aarna..
© 2015 Ashoka Property Developers. All rights reserved.